Three Important Gauges Every Evo 8/9 Needs! New cars come and go, but with MAP’s massive catalog of Evo 8/9 parts and accessories, it’s easy to make your favorite car…well, evolve. While most of the world got to experience the Mitsubishi Lancer Evolution at some point in the 1990s, it wasn’t until 2003 and the Evolution 8 that the U.S. got its hands on the compact sport sedan. But the rally-based car quickly made up for lost time, and even a decade after the Mitsubishi Lancer Evolution IX was discontinued, the Evo 8 and Evo 9 remain popular and competitive on the racing circuit and among hobbyists. Our inventory of aftermarket high performance parts and Evo OEM replacement parts will get you many more years of great use. Both the Evo VIII and Evo IX are based on eight-generation Lancer technology. As such, our thousands of aftermarket Evo parts are interchangeable between the two models, giving you endless options. Our Lancer Evolution engine components include cylinder heads, camshafts, pistons and timing belts for everything from routine maintenance to complete rebuilds. 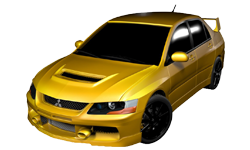 If your 2006 Mitsubishi Evolution IX turbo system is no longer getting it done, upgrade from our selection of turbochargers, intercoolers, wastegates and boost controller systems. From air intake systems to gauges, we have everything you need for your Mitsubishi Evo 8/9 at the lowest guaranteed prices. MAP even has wheels and body panels to stay ahead of the style curve. Our inventory includes components from all of the leading aftermarket parts manufacturers, along with quality OEM Evo replacements. MAP’s mechanics and enthusiasts have worked on a lot of Mitsubishi Evos over the years, and they have used that experience and knowledge to put together some helpful rebuild and upgrade kits that will save you time and money. 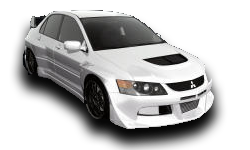 We’ve even manufactured some of our own high-performance Evo 8/9 parts! Call us at 1-888-MAPerformance to learn more about what we have to offer for road racers, drifters, rally racers and others who stand by the Evo. We are ready to ship out these parts today so you can deliver the goods on the track. Select your Car for the best browsing experience.